Don’t let the icicles dangling from your home fool you into thinking they are a delightful winter season add-on to your home’s aesthetic. 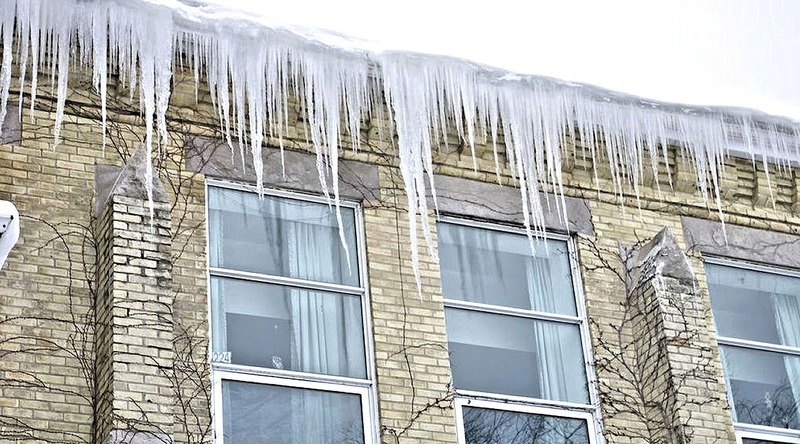 Icicles can tear off gutters, loosen shingles, and worst of all, cause ice dams. Learn more about ice dams below so you can enjoy a winter free of roofing problems. Ice dams are chunks of ice that form at the edge of a roof, which can prevent melting snow from properly draining. The water that backs up behind the ice dam can end up reaching underneath your shingles and make its way into your home. – It doesn’t take much moisture to form an ice dam. Although thick snow accumulation creates ice dams more quickly, they can occur with very little snow on your roof. – When it comes to insulation, more is not always better. Improperly insulated homes are just as bad as under insulated ones. – You can’t always see ice dams from the ground. Sometimes, ice dams grow up valleys and on top of dormers making it almost impossible to identify from a ground-eye view. A key step in preventing ice dams is by simply keeping your attic and roof cold – if your roof is warm, it will melt the snow which can then freeze to ice, which leads to ice dams. 1. Close up your attic bypass – About one-third of your home’s heat loss is through the ceiling into the attic. Experts will fix any air leaks caused by unblocked walls, gaps in drywall, and cracks around light fixtures. By stopping this air leakage, you’ll also end up saving energy which will reduce both your heating and air conditioning bills. 2. Measure your attic insulation level – Building codes require about 12 to 14 inches of insulation. If you have less than eight inches, we highly suggest adding more. 3. Add roof and soffit vents – This task draws in cold outdoor air and flushes out warmer attic air, cooling the attic as well as the roof. Preventing damage from an ice dam is all about being proactive, so when you think you may have a problem, call Landmark Exteriors, we can help you address any roofing issue. Some of our services include roof inspection and repair, ice damming, snow guard installation, roof snow removal, and more. Visit our website to learn more about our services and our preventative maintenance plans, or give us a call at 203.838.3838!